Walter Raphael Hazzard Jr., later Mahdi Abdul-Rahman (April 15, 1942 – November 18, 2011) was an American college, Olympic and professional basketball player and college basketball coach. He was best known for his association with the men's basketball team at the University of California, Los Angeles (UCLA), having been a star player for that team when it won its first national championship in 1964 and having served as the team's head coach in the 1980s. Hazzard attended Overbrook High School in Philadelphia, where his teams went 89-3 and he was named the city's player of the year when he was a senior. Hazzard then went on to UCLA, where he became a key player on the varsity basketball team. In Hazzard's first season on the varsity squad, the UCLA Bruins made their first Final Four appearance in the 1962 NCAA Toournament. They lost 72-70 to Cincinnati, the eventual champion, in the semi-finals. UCLA's first undefeated season of 1963–64 was in no small part due to Hazzard, his backcourt partner Gail Goodrich, and the team's coach John Wooden. The team won its first NCAA Championship, and Hazzard was selected by the Associated Press as the tournament's Most Valuable Player. Following UCLA's victory in the 1964 tournament, Sports Illustrated featured a cover photograph of Walt Hazzard dribbling the basketball up court and the headline, "UCLA Is The Champ. Walt Hazzard Drives Through Duke." Hazzard was chosen as an All-American and also selected as College Player of the Year by the United States Basketball Writers Association (USBWA). His number 42 jersey was retired by UCLA in 1996 in Pauley Pavilion, but Hazzard gave his permission for stand-out recruit Kevin Love to wear the number. Hazzard and Bill Bradley earned a spot on the 1964 Olympic basketball team for the U.S., which unsurprisingly won the gold medal. He was pre-draft territorial pick in 1964 by the Los Angeles Lakers. Hazzard later played in the NBA, first with the Los Angeles Lakers from 1964–1967, then the Seattle SuperSonics, the Atlanta Hawks, the Buffalo Braves, and briefly for the Golden State Warriors. He returned to the SuperSonics for the 1973–74 season, after which he retired from professional basketball. While playing for the SuperSonics in their inaugural 1967–68 season, Hazzard scored a career high 24.0 points per game, averaged 6.2 assists per game, and was selected to play in the 1968 NBA All-Star Game. Seattle traded him to the Hawks during the off-season for Lenny Wilkens. 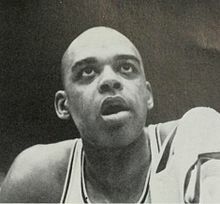 Hazzard's career high average in assists came during the 1969–70 season, when he averaged 6.8 assist per game while playing for the Hawks. In 1984, he returned to UCLA as its men's basketball coach, twenty years after winning the national championship as a player. That same year, he was inducted into the UCLA Athletics Hall of Fame. He coached for four seasons, winning 77 out of 125 games. The 1984–1985 UCLA Bruin basketball team won the NIT championship. The 1986–1987 UCLA Bruin basketball team won both the Pac-10 regular season championship as well as the inaugural Pacific-10 Conference Men's Basketball Tournament. However, after the 1987-88 Bruins finished only two games above .500 — the closest they had come to a losing record in 40 years — Hazzard was fired. He later spent a number of years working for the Los Angeles Lakers, first as an advance scout on the west coast and later as a special consultant. During his professional basketball career, Hazzard converted to Islam and changed his name to Mahdi Abdul-Rahman. However, he felt that the name change was poorly received in basketball circles, believing that it cost him opportunities, both during and after his playing career. Therefore, although he remained devout in his Muslim faith, he chose to return to using the name Walt Hazzard professionally. Hazzard and his wife Jaleesa had four children: Yakub, Jalal, Rasheed, and Khalil, the last being a record producer, well known in hip-hop circles by the stage name DJ Khalil. His grandson, Max Hazzard, plays basketball for U.C. Irvine. On March 22, 1996, Hazzard was hospitalized following a stroke. Although he made a substantial recovery over the ensuing years, his health never returned in full and subsequent to his illness he was much less active in the public sphere. Shortly after the stroke, Lakers owner Jerry Buss promised Hazzard's family that he would remain on the team's payroll as long as Buss owned the team; Hazzard remained a Lakers employee for the rest of his life. By the middle of 2011, his health had deteriorated significantly and he was hospitalized in intensive care. On November 18 of that year, Hazzard died at the UCLA Ronald Reagan Medical Center due to complications following heart surgery. He was 69. Walt Hazzard is interred at Rose Hills Memorial Park in Los Angeles. ^ Ex-Bruins coach Hazzard is stable following stroke. Los Angeles Daily News, March 23, 1996. ^ Shelburne, Ramona (February 19, 2013). "Jerry Buss: A true sports visionary". ESPNLosAngeles.com. Retrieved February 21, 2013. This page is based on the Wikipedia article Walt Hazzard; it is used under the Creative Commons Attribution-ShareAlike 3.0 Unported License (CC-BY-SA). You may redistribute it, verbatim or modified, providing that you comply with the terms of the CC-BY-SA.